SUMMARY: Millennials have received a lot of attention as the largest demographic generation today. How are their shopping preferences different from those of Baby Boomers? Using the data from 1,020 shoppers surveyed by Neustar, this Chart of the Week examines shopping preferences based on age. Recent research shows that mobile email opens have surpassed desktop opens for the first time. Smartphone purchases will also soon surpass desktop purchases, with 49.3% of conversions taking place on smartphones. Last week's Chart of the Week looked at the specific differences between mobile and desktop conversions. It’s not just Millennials who are driving this trend. According to Neustar, shoppers over 55 years of age reported that they plan to click on more mobile ads and shop more on mobile devices this year. The above chart shows the five surveyed areas where there were significant differences between Millennials' and Baby Boomers' expected behaviors. The only area where there was no significant difference between the age groups was in their likelihood to print physical coupons to redeem in a retail store. Both Millennials (34%) and Boomers (30%) expected to print more paper coupons and redeem them in stores. Let’s take a deeper look at what the shopping differences between generations are, and how you should consider these preferences when devising your marketing strategy. According to Neustar, 54% of Millennials say that their mobile device is the most important shopping research tool versus 31% for desktop, 8% for television and 7% for print. 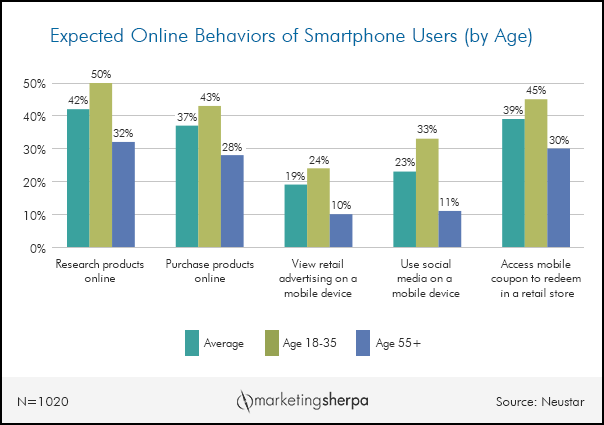 How are Millennials using their smartphones to make purchase decisions? "Millennials are incredibly engaged with companies and brands on social media platforms," Brad Jefferson, CEO and Co-founder, Animoto, said. "Our study found that 76% [of Milliennials] follow companies or brands on YouTube, 84% follow brands on Facebook and nearly half follow brands on Twitter. It follows that building a marketing strategy with a social focus is incredibly effective when targeting this audience, especially when it’s a strategy designed to foster sharing and engagement," he said. One of the best ways to drive social engagement is to create campaigns that encourage it. Coca-Cola encouraged people to share video clips of themselves taking a sip of Coke to create a fan-made commercial. HotelTonight became the top most downloaded app in its category in one month by encouraging customer feedback, interaction and sharing on social media. You don’t have to be a big brand like Coke to create this type of campaign. "Creating a low-budget video will be just as shareworthy for your customers if it’s fun, and asking your fans to share photos and video clips in order to repurpose them into a marketing video is a great, low-cost way to create content that will be shared by everyone involved," Jefferson said. "One of the biggest mistakes marketers make when targeting Millennials is sticking to the age-old strategy of targeting life stages — getting married, buying a home, having children," Jefferson said, adding that "the truth of the matter is, Millennials are the first generation [that is] living way outside the box when it comes to these things. They’re getting married and having children later, waiting to buy homes and spending differently at different times. Life stages marketing simply doesn’t resonate with them as it resonated with older generations." Instead of focusing on life stages, focus on social groups, values and identities. "If you can tap into what Millennials are passionate about, they will be much more engaged and willing to spread the word about your business," Jefferson said. There has definitely been more media hype and recent research geared towards Millennials. According to a 2015 report from the Pew Research Center, Millennials are the largest demographic generation in the U.S. with 75.3 million people. Ever-changing technology has also impacted how Millennials shop and interact with brands. However, evolving technology has changed Boomer shopping behavior as well. Boomers still account for the majority of American wealth — 70% of the nation’s disposable income comes from this demographic. Baby Boomers also account for $230 billion in sales of consumer packaged goods, according to a 2012 study from Nielsen. Millennials are not the only demographic that prefers mobile usage to desktop. A third (32%) of Americans ages 55 and up research products online with smartphones. According to recent MarketingSherpa research, Americans aged 55-64 prefer to communicate with companies through email more than any other channel. "Boomers may not be digital natives but as digital immigrants they certainly don’t shy away from embracing ecommerce and online offers. I see this first-hand with my mother-in-law; she shops online all the time," Lisa Joy Rosner, Chief Marketing Officer, Neustar, said. Brands are using more sophisticated tactics to gain the Boomers’ share of wallet. "We’ve seen companies like AARP develop marketing campaigns that engage Boomers on mobile and online devices," Rosner said. As much as Millennials use smartphones, mobile is not the only device this demographic uses . Only slightly more than half (54%) said their mobile device was the most important shopping research tool. According to the Neustar study, 75% of Millennials and 78% of Boomers report having been moved to begin researching a product or specific retailer by in-store visits to a retailer, with promotions (coupons/discounts) as a close second with 73% of Millennials and 76% of Boomers. Mobile is not the only device used to begin a consumer's product search. Two-thirds (67%) of Millennials and 64% of Boomers admit television and radio started their search, and more than half of Millennials (58%) and Boomers (59%) said newspapers/magazines were instrumental in starting their search. Also, more than half of Millennials (51%) and Boomers (57%) said direct mail/print catalogs/circulars started their search. Channel fragmentation can be even more challenging when marketing to Boomers who, in many ways, have one foot in and one foot out of smartphone usage. While they have the technical savvy to take advantage of the ease and universal access to information smartphones provide, they still aren’t digital natives and therefore consult (and trust) many traditional channels as well. According to Neustar, more than half (55%) of Boomers named desktop as their preferred device, followed by mobile (21%), television (20%) and print (4%). "The perception that Boomers aren’t technically savvy just isn’t accurate and marketers are looking closer at what behavior drives different device uses. Boomers may prefer their desktop device for viewing ads but when it comes to redeeming a coupon they will also use their mobile device," Rosner said. Neustar’s research has shown that Boomers rely on online research before making purchases and marketers can use this information to design marketing tactics, such as PPC and SEO, to engage with consumers at the right time in their purchasing journey. "Boomers are slightly more reliable consumers because their behaviors are more predictable," Rosner said, adding that "marketers that understand how Boomers research products and make decisions along the consumer journey will win. We’ve seen companies engage with Boomers across multiple screens depending on which stage of the purchase journey they are in. A one-size-fits-all approach just doesn’t work when implementing cross-device campaigns." "I would say marketers aren’t reaching out to Boomers enough on digital platforms as much as to other demographics," Rosner said. "Boomers aren’t blind to the efficiencies of digital channels; marketers just need to engage with Boomers in a way that resonates with them." Marketers who only focus on behavioral data without taking into consideration the identity of consumers won’t win the battle for relevancy. This will happen when marketers deliver the same ad to a segment without considering that not everyone truly belongs in that segment. "For example, a Boomer might be included in a segment geared toward Millennial surfers just because they bought a gift for their grandchild," Rosner said. "Just looking at one facet of [a] consumer’s behavior will result in irrelevant ads and wasted media spend." Location is another way to segment your audience. However, consider concerns about privacy when targeting customers based on this information. Regarding privacy, Neustar asked how comfortable shoppers are sharing their location with a retailer on a scale from "very comfortable" to "not at all comfortable." The largest difference between Millennials and Boomers was in the "very comfortable" category — only 8% of Boomers felt very comfortable with sharing their location versus 19% of Millennials. The majority of Boomers are "somewhat comfortable" (36%) and "neutral" (23%) about sharing their location, while the majority of Millennials are "very comfortable" and "somewhat comfortable" (40%) with it. "Our research has shown that only 7% of consumers grade advertisers with an 'A' for the relevancy of their ads," Rosner said. "Developing omnichannel campaigns customized to a specific generation and with a 'privacy by design' stance will give marketers a clear advantage in the race for customer loyalty."